Since the remarkable success of Maria Montessori's first school ninety years ago, her theories have had a revolutionary influence on educational practices around the world—not only in avowed Montessori schools but also in learning programs of every type. In the United States alone there are thousands of schools dedicated ot the Montessori method, and there are many others that have incorporated much from her teachings. This newly revised and updated edition of The Essential Montessori will be welcomed by long-term practitioners and newcomers to the method alike. Concise and readable, the book has been relied upon for almost two decades as the definitive guide to the writings of Maria Montessori and to the teaching and application of her ideas in today's educational arena, as well as being an indispensable sourcebook for teacher training programs, advice on choosing schools, materials needed for the classroom, and much more. 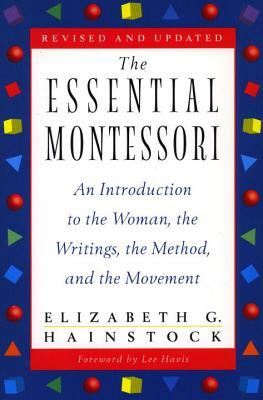 The Public School Montessorian says of the author: "Her books on Montessori education almost certainly establish her as the most widely read interpreter of Montessori in the United States.… Her writing is clear and accessible, unfettered by jargon." For those interested in the best education for their children, this volume fully lives up to its title. It has earned its place as the essential work on the subject. Certified as a Montessori teacher by St. Nicholas Training Centre in London, and active on behalf of the method since 1960, Elizabeth G. Hainstock became a Montessori consultant for the Department of Health, Education and Welfare in 1971. She currently sits on the board of the International Montessori Society and makes her home in San Juan Bautista, California.